Oh, but this is so bad, so disappointing in so many ways. Seth MacFarlane showed more talent on Jimmy Kimmel doing a Liam Neeson impression than he does in this full movie here. One indication he’s lost his way: In one fifteen minute period in this film, there are three musical sequences, including one showing woods animals at night while Amanda Seyfried sings about the moon. 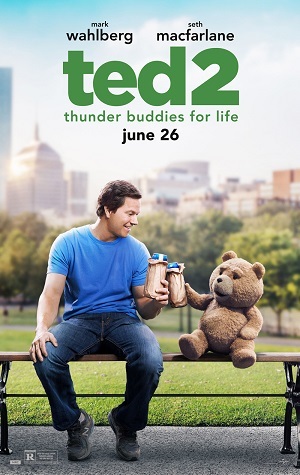 The movie jumps around from being a bromance to being a chase film, and from being a poor excuse for a comedy to being a poor excuse for a serious film where both Seyfried and Freeman argue the case for Ted’s “personhood” in front of a jury, both using exactly the same argument in different words. But mostly – maybe even exclusively – what it is, is a druggy, juvenile, racist, gross-out reason to see a different movie. Want laughs? You’re going to need to find them elsewhere; this teddy bear just ain’t funny.